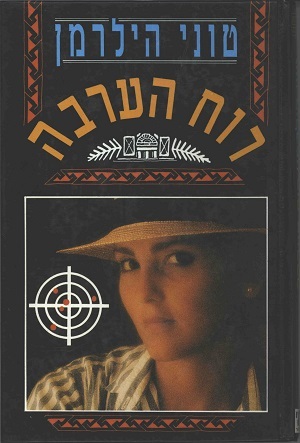 Tel Aviv: Shalgi Ltd., 1991. This is the 1991 Hebrew hardback edition of Coyote Waits, which is Tony Hillerman's tenth Navajo Mystery novel. This edition was published by Shalgi LTD. Publisher in Tel-Av-iv, Israel. The name of the translator is not mentioned. Format: Hardback, 21.5 x 14.1 cm. Binding: Full color boards with a photographic image of a young woman and a target with bullet holes.